A surge of awareness has come about in recent times, and more people are questioning authority and seeking the truth, wherever it may be lead. One thing we are continually asked is how to meet others who have a similar perspective on what is really going on. Some wish to study and others need answers, whatever it may be, try looking for a collective near you. 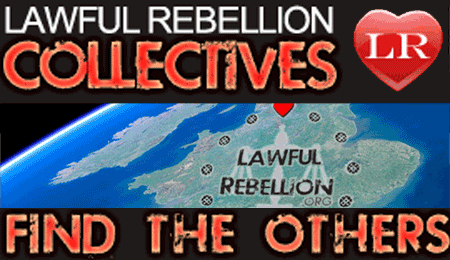 Lawful Rebellion collectives is an open invitation to seek and be sought for contact. You are able to place a marker on the collectives map in order to be contacted in any manner you please. If you do not wish to add a marker you can simply search in your local area for a point of contact. You can find details of Occupy camps, White Rabbit / Universal community trust network local contacts, TPUC people, Lawful Rebels and everyone else who wants to show some unity. When adding a map marker, please note that locations do not have to be exact and can simply be your approximate region should you feel more comfortable this way. Your use of Lawful rebellion collectives is entirely of a voluntary nature, and in full understanding that any submission of details is your acceptance that they will be used as part of an interactive map so others may contact you. You may request your marker removed at any time. Lydia – you’ ve been added. Anyone else reading this please note comments are now disabled. To get on the map please follow the simple instructions above this comment. Richy.